The National Research Mentoring Network - Committee on Institutional Cooperation Academic Network (NRMN-CAN) initiative aims to provide professional development experiences to aspiring scientists, and to assist mentors in developing core competencies for mentoring and grant writing. Participating universities in the program include the Big Ten Academic Alliance institutions, and the University of Chicago, which leads the project. The initiative is part of The National Research Mentoring Network (NRMN). NRMN is a nationwide consortium of biomedical professionals and institutions collaborating to provide all trainees across the biomedical, behavioral, clinical and social sciences with evidence-based mentorship and professional development programming that emphasizes the benefits and challenges of diversity, inclusivity and culture within mentoring relationships, and more broadly the research workforce. The goal of the National Research Mentoring Network is to enhance the diversity of the NIH-funded research workforce. The program’s kick-off conference in November 2015 featured professional development and grantsmanship skill building. The event brought together more than 50 postdocs and early career junior faculty members, and 40 experienced faculty members and administrators. From UW–Madison, 6 postdocs participated as trainees and Dr. Amy Kind (Associate Professor, Medicine) received training in NRMN group-based grant writing coaching design. Following the conference, Dr. Paul Campagnola (Professor, Biomedical Engineering) was recruited to receive NRMN training and to lead an ongoing grant writing coaching group for 3 NRMN-CAN postdocs from our campus. In March 2016, 44 faculty and staff participants learned how to implement mentor training on their home campuses for graduate students, postdocs, or faculty mentors. Two UW–Madison staff participated in the workshop, Andrew Cusick (Office of Postdoctoral Studies) and Sally Wedde (Institute for Clinical and Translational Research). Both committed to offer the training on our campus within the following year. Postdocs were invited to attend the postdoctoral mentor training workshop in June 2016 and reflected on how to be a more responsive mentor as well as a more proactive mentee. 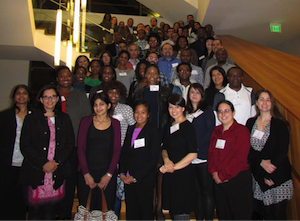 Participation was restricted to 45 participants and 4 UW–Madison postdocs to attended the workshop.